How can Dynamics 365 F&O help? 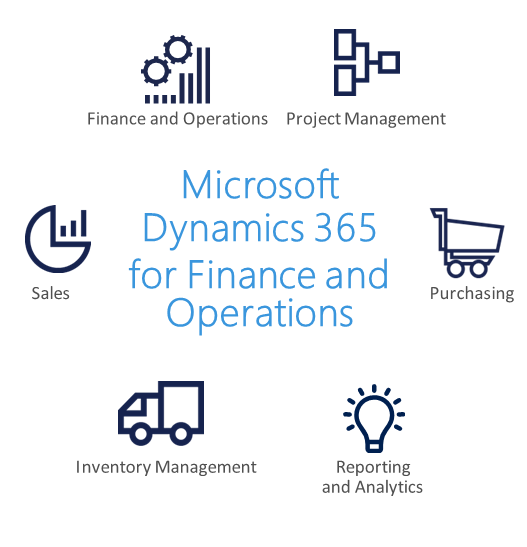 Dynamics 365 for Finance and Operations (formerly called Dynamics AX) is Microsoft’s flagship enterprise resource planning (ERP) suite. Seamless integration with Dynamics 365 customer relationship management (CRM) apps and Office 365 enables faster business processes and smarter decision making. Identify issues proactively and streamline business processes with real-time analysis of system performance and usage, advanced telemetry and diagnostics. Utilise all business logic any time, any place, on any device, through a clean, modern and intuitive browser-based UI that is a pleasure to use and easy to learn. Avoid cost and risk, and minimise deployment time, by modelling and testing the system in the Azure-based Lifecycle Services portal providing end-to-end application management. Support processes across the supply chain by combining best-fit manufacturing processes into a unified solution. Accelerate delivery of finished products with advanced warehouse and logistics management. Take advantage of real-time and predictive analytics to identify issues and improve production processes. Minimise costs by synchronising logistics across sites, warehouses, and transportation modes. Automate procure-to-pay and order-to-cash to streamline processes from purchasing to delivery. Reduce operational costs across business geographies with financial process automation, encumbrance, budget planning, budget control, and three-way matching. Adapt the application to changing needs with no-code visual editors and flexible tools for building web and mobile apps. Reduce the cost and complexity of operating a global infrastructure with the trusted Microsoft cloud platform providing state-of-the-art security and compliance. Benefit from enterprise grade Service Level Agreements, round-the-clock tech support and built-in disaster recovery to protect data and workloads without the additional costs of a data center.